From the perspective of purposes, extrusion bulking machine can be divided into cereal extruder machine(mainly used for puffing corn, millet and other grain cereals), flour extruder(mainly used for puffing wheat and flour), soybean extruder (mainly used for puffing soybean) and feed extruder machine (mainly used for food extrusion, poultry feed or puffing single raw material). As a type of feed inflating machine, fish feed extruder, including single screw fish feed extruder and double-screw fish feed extruder, is mainly designed for producing pellet feed for fish, shrimp, pets and other aquaculture. With higher feed conversion ratio, fish compound feed produced by single screw fish feed extruder can maintain high water quality of fishpond. 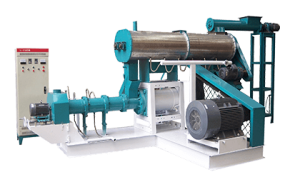 As the leading professional fish feed production line and fish feed machine series manufacturer, FANWAY Fish Feed Machinery has released two types single screw fish feed extruder – dry type and wet type fish feed extruder so as to meet the ever-increasing demand for fish feed pellet production. As the below figure shows, it’s clear that FANWAY dry type single screw fish feed extruder is chiefly composed of electrical control cabinet, cutting motor, heating plate, extruding chamber, feeding device, feeding motor and main motor. With simple structure, the machine is easy to operate. Before turning on the dry type fish feed extruder, users need to put feed raw materials into the machine through feeding device, , and the materials will be through hardening and tempering in the conditioner with high temperature and high pressure. With propulsion plant, materials will be sent to extruding chamber that consists of screw and chamber, and extruded and expanded under the action of extrusion, intense shearing, blending and friction. When pushed out from chamber, feed pellet’s temperature and pressure become normal with surroundings, making the moisture of feed sharp vaporization, which makes feed porous and fluffy, commonly called puffing. Moreover, dry type single screw fish feed extruder also has different molds and cutting device for producing feed pellets with various diameter and length. The following picture tells that the structure of wet type single screw fish feed extruder is a bit complicated than the dry type. Except for control panel system, cutting motor, feeding advice, feeding motor, extruding chamber and main motor, the wet type also contains air outlet, conditioner motor and pre-conditioner. 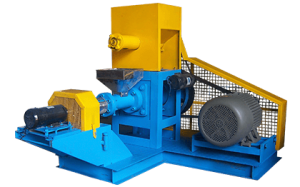 Compared with dry type extruder, the most difference is that during production process, wet type fish feed extruder is equipped with a boiler that needs to add water or steam into machine in order to promote water content to 20%-30% while feed pellet moisture produced by dry type extruder ranges from 15%-20%. Meanwhile, bacteria and germ infections can be killed and cleaned under the action of high temperature and high pressure. ★ Choose fish feed extruder according to daily requisite amount of feed. Taking aquatic feed field for example, FANWAY will introduce the basic functions of this machine during the process of producing fish feed pellets. ◇ Cohesive function: in the extrusion process, feed raw material can combine closely and condense into discrete pieces. ◇ Degassing function: blister in the raw materials of feed will be eliminated during the expansion process. ◇ Dehydration function: in general, water content of feed material will loss about 4%-7% on the original basis during the process of extruding fish feed. ◇ Expansion effect: the operation condition and configuration of single screw fish feed extruder can control the density of pet feed and aquatic feed pellets, which is also called floating pellet or sinking pellet). ◇ Jelling function: high temperature and press extrusion process can make the starch(coming from raw material, like tuber or cereal) of fish or pet feed pellet pasting. ◇ Grinding function: in the feed material processing, raw materials will be ground to a certain extent within single screw fish feed extruder machine. ◇ Homogenization function: this homogenization of extruder can change the structure of unappealing raw material and make material become more acceptable form. ◇ Mixing effect: when extrusion processing, there are various screw and molds to choose, which makes extruders produce the expected mixing capacity. ◇ Sterilization function: during the process of expanding feed, the Pasteurella bacterium of raw materials can be eliminated through extrusion technology. 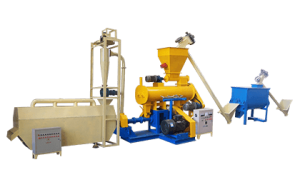 Q: What is the biggest difference between dry type and wet type single screw fish feed extruder machine? A: With the same power, the biggest difference is that wet type extruder with larger capacity has a conditioner for steam boiler while the dry type doesn’t, so the latter one is cheaper. Besides, feed pellets produced by wet type fish feed extruder is much more smooth. Q: What is the material requirement of FANWAY Fish Feed Machine? Q: How long does the fish feed produced by this machine float on the water? A: These floating fish feed pellets can float on the water surface for more than 24 hours. Q: Is it available to use this extruder to produce pet feed pellets? A: Yes. This machine can make floating and sinking aquatic feed and pet food pellets with different shapes and length. A: The formula is always based on the practical situation of farmed fish. FANWAY can provide formula for free. Click to learn more about fish feed formulation. Q: What’s the advantages of fish feed produced by FANWAY single screw fish feed extruder? –Users can use the machine to produce both floating feed and sinking feed for fish and pet. –With long time floating on water surface, floating feed are better to be absorbed and digested, avoiding feed waste and water pollution, which also makes it easy to observe the average capacity for eating. –Under the action of high temperature and pressure, fish feed extruder can kill the colibacillus and salmonella easily, ensuring feed clean and sanitation for fish and pets. –Feed pellets made by FANWAY fish feed extruder have unique taste and high nutrition. Q: What shape does single screw fish feed extruder machine produce? –For fish feed pellets, sizes range from 0.9mm to 15mm. –For Pet feed pellets, there are nine shapes to choose, including three prism shape, triangles, cross shape, square shape, plum shape, feet shape, wafer shape, large bone shape and small bone shape.